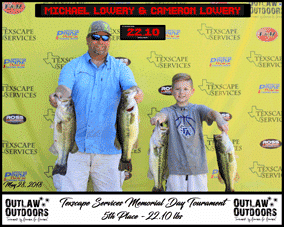 The Texscape Services Third Annual Outlaw Outdoors Memorial Day Tournament presented by Ross Motorsports is in the books with one duo dominating the other 79 teams. 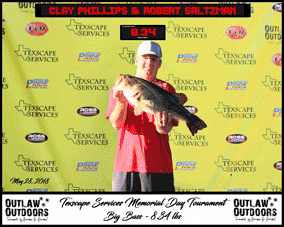 It started early in the morning around 7:30 when Clay Phillips and Robert Saltzman caught their big fish of the day. They knew with the predicted hot temperatures, it would be a challenge to keep a fish of that size healthy in their livewell, so they chose to bring her in and weigh her early so we could get her back into the lake while she was healthy. It was the first fish of the day to weigh in and topped the scales at 8.34 pounds. They went back out to catch four more fish and finish their stringer. Eight hours later they brought in those four fish and those combined with their big bass gave them a total of 26.47 pounds. 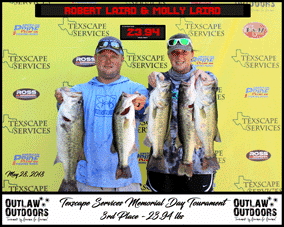 That stringer not only held on for the win, but they also took home Pride Rods Big Bass honors. 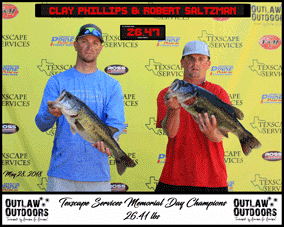 Phillips and Saltzman left the Cassels Boykin Pavilion with checks for $2,200, certificates for two Pride Rods and V&M tackle packs for a grand total of $2,900. 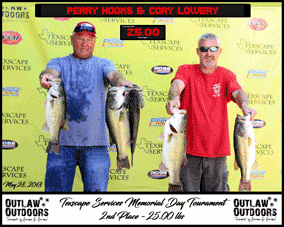 The team of Perry Hooks and Cory Lowery brought in an impressive bag weighing 25.00 pounds for second place and $1,350. 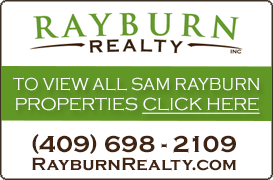 The husband-wife team of Robert & Molly Laird won a check for the fourth day in a row! Their success started on Thursday with a top finish in an evening tournament and continued all the way until Monday! They brought in five fish weighing 23.94 pounds that earned them $1,150. 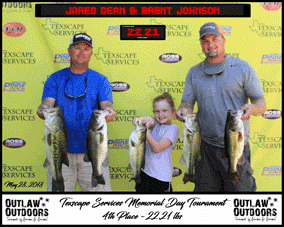 The fourth place check in the amount of $1,000 was handed out to Brent Johnson and Jared Dean for their stringer of 22.21 pounds.